The final checkout was completed, we arrived home and I scooped up my babies to greet them after several (wonderful!) days away. I kissed my husband hello, soaked in the familiar comforts of home and settled in to enjoy the after-effects of an incredibly uplifting, wonderful retreat. I heard story after story about how wonderful the retreat was and heard first-hand how impactful the attendee’s time together was. I was on this incredible high for about a week after the retreat as I saw each of our attendees implement so much of what they’d learned and apply it to their every day life as an entrepreneur. As time wore on and my gratitude for the work of so many people to pull off such a wonderful time settled in, so did my discomfort. I couldn’t pin point it, but I started to feel down. I should have been on an incredible high and I should have felt completely unstoppable. The word was starting to get out about Root & Restore and every single bit of it was good. My dream of pouring into small-business owners and empowering them to have tangible tools to combat feelings of insecurity, self-doubt, comparison and much more became a reality. I had everything I could ask for at that time. I’d had a successful retreat. I also felt really sad. I identified so much with the feeling of a deflated balloon that was just blowing in the wind. It’s so important to share that as the content of Root & Restore is incredibly valuable, it also matters that I take the information to heart and implement it for myself. I absolutely must practice what I preach. Since I wasn’t able to find the right next steps for myself, I did what I knew to do and turned into my Root & Restore community. I talked to some of the ladies that I had just poured into mere weeks before and allowed them to speak truth back into me. I also confided in past Root & Restore alumni to allow them to speak truth to me as well. What came of those conversations was not only deepened connection, but a reminder that in planning so fervently for the retreat, I failed to look beyond that weekend. I was so hell-bent on making the retreat weekend an incredible time that I didn’t look even five minutes beyond that time, much less five days. This meant that as I settled back into my post-retreat work routine and tried to continue moving Root & Restore forward, I felt lost. I felt empty and weary. It can be difficult to know in your heart and mind that you are doing good, appropriate work and simultaneously feel deflated. If you’ve ever felt this way, I want to encourage you that you are not alone. In a section of the Root & Restore content, we touch on celebrating achievements as they come. The big ones and the small ones. Wouldn’t you know it… I ABSOLUTELY didn’t stop to celebrate this huge accomplishment of a successful first retreat! I didn’t give myself a single moment of grace to rest from our time together OR evaluate and celebrate the dream-come-true that the retreat was for me. 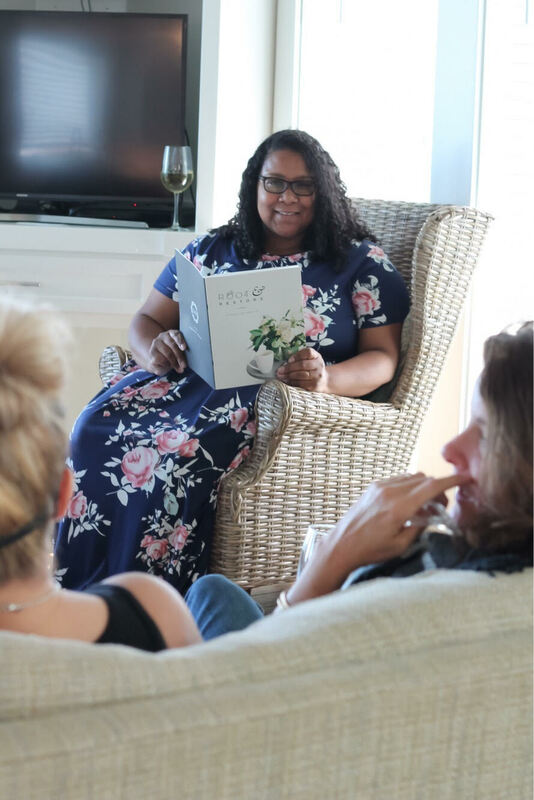 I was so focused on my next steps that I gave no value to the work, thoughtfulness and intention I put into the retreat when they, in actuality, held IMMENSE value. So, here I am, almost three months later. My real life consists of a sweet little babe who isn’t fond of sleep and a rambunctious 4 year old who loves to be on the move. I’m balancing motherhood, being a wife and entrepreneurship. I am truly just like you. Just like I tell every person who interacts with Root & Restore, I needed to give myself the space to 1. REST and 2. celebrate the accomplishment that is our first retreat. I’ve asked for help (a whole blog topic in and of itself!!) and have given myself space to rest. As I’ve done that, I’ve felt the passion & motivation for my work slowly start to seep back into each day. I’m working on celebrating my first retreat- that just takes a bit more intentional work. Now, who wants to meet me for champagne and fun? We’ve earned it!